Getting a well installed, dependable roof sure takes a residential roofer with a lot of skill, experience and common sense. It takes a roofing company that cares more about the end result and less about high-pressure sales and rushing roofing jobs to get to the next one. Getting a quality residential roof boils down to two things: quality roofing products and skilled roofers to install them. Redhammer Roof Group has both. Your home’s roof and exterior take the blunt of damaging elements. Kansas City has some extreme weather between summer and winter, but even under the best weather conditions roofing shingles age and materials deteriorate. Even though roofing materials continually improve in strength and durability, roofing experts must precisely install them to live up to their warranties. 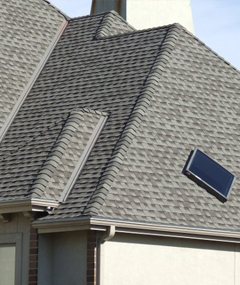 If installed correctly, your residential roof can last decades. Redhammer Roof Group has been proving this for years whether it’s roof repair, roof replacement, guttering or masonry work. We combine installation fundamentals with today’s increasing high standards of materials and manufacturer-recommended techniques. Only then will your roof stand the test of time and the elements. From the telltale signs of graceful slate and the beautiful graying of wood shakes to the earthy colors of tile and eco-friendly solar roofing, today’s roofing options go far beyond mainstream materials and forms. Roofing choices range from a growing selection of materials and textures to the latest finishes, hues, and decorative touches. Redhammer Roof Group chooses our roofing products much like you choose your roofing contractor. Our criteria are simple, but tough. Our residential roofing shingle suppliers manufacture the country’s best quality roofing materials available on the market today—CertainTeed, GAF and more. Collectively, these companies have been in business for centuries and continue to set the standard for durable residential roofing materials. Our representatives will be happy to provide a stack of roofing shingle and material options and customer comments for your review. And of course our expert advice on how to achieve the look and protection you’re looking for in your new roof.